One of my chapters in the upcoming PowerShell Deep Dives book just became available as part of the MEAP program at Manning. If you aren’t a part of the early access program, you should definitely check it out! Otherwise, you can wait until it gets published later this year. Either way, I had a lot of fun writing this chapter and hope you enjoy it too! 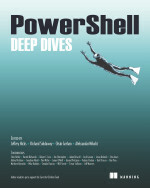 This entry was posted in News, powershell and tagged book, deep dive, Powershell, tcp. Bookmark the permalink. Hi mr. Prox, interesting stuff. Do you think powershell can be used to check for word documents “integrity” ?? the working recovered files (word, excel, …) from the broken ones. Do you think powershell can be used to do that. ?